Two weeks ago, I had the pleasure of attending the 17th International Semantic Web Conference held at Asiolomar Conference Grounds in California. A tremendously beautiful setting in a state park along the ocean. This trip report is somewhat later than normal because I took the opportunity to hang out for another week along the coast of California. These are roughly the same as the last time ISWC was held in the United States. So on to the major themes I took away from the conference plus some asides. It wasn’t just the majors who have or are deploying knowledge graphs. The industry track in particular was full of good examples of knowledge graphs being used in practice. Some ones that stood out were: Bosch’s use of knowledge graphs for question answering in DIY, multiple use cases for digital twin management (Siemens, Aibel); use in a healthcare chatbot (Babylon Health); and for helping to regulate the US finance industry (FINRA). I was also very impressed with Diffbot’s platform for creating KGs from the Web. I contributed to the industry session presenting how Elsevier is using knowledge graphs to drive new products in institutional showcasing and healthcare. Beyond the wide use of knowledge graphs, there was a number of things I took away from this thread of industrial adoption. Technology heterogeneity is really the norm. All sorts of storage, processing and representation approaches were being used. It’s good we have the W3C Semantic Web stack but it’s even better that the principles of knowledge representation for messy data are being applied. This is exemplified by Amazon Neptune’s support for TinkerPop & SPARQL. It’s still hard to build these things. Microsoft said it was hard at scale. IBM said it was hard for unique domains. 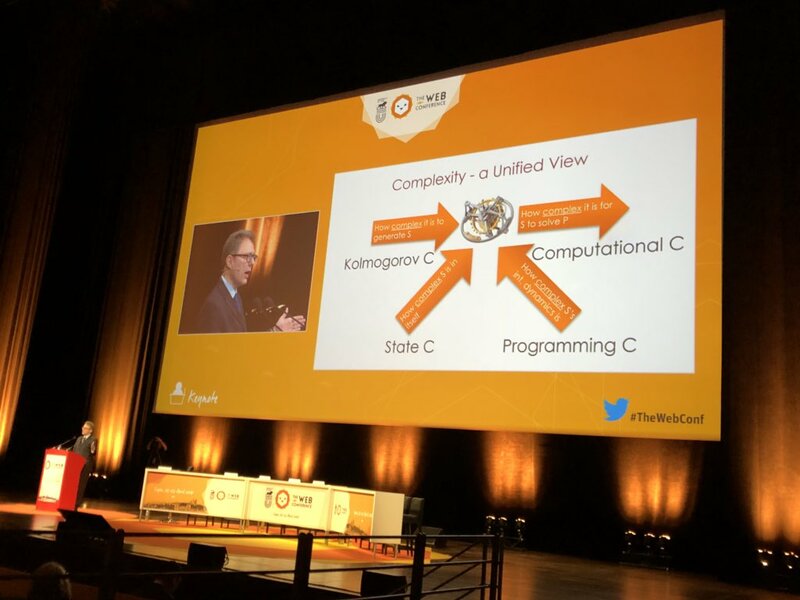 I had several people come to me after my talk about Elsevier’s H-Graph discussing similar challenges faced in other organizations that are trying to bring their data together especially for machine learning based applications. Note, McCusker’s work is some of the better publicly available thinking on trying to address the entire KG construction lifecycle. Identity is a real challenge. I think one of the important moves in the success of knowledge graphs was not to over ontologize. However, record linkage and thinking when to unify an entity is still not a solved problem. One common approach was towards moving the creation of an identifiable entity closer to query time to deal with the query context but that removes the shared conceptualization that is one of the benefits of a Knowledge Graph. Indeed, the clarion call by Google’s Jamie Taylor to teach knowledge representation was an outcome of the need for people who can think about these kinds of problem. 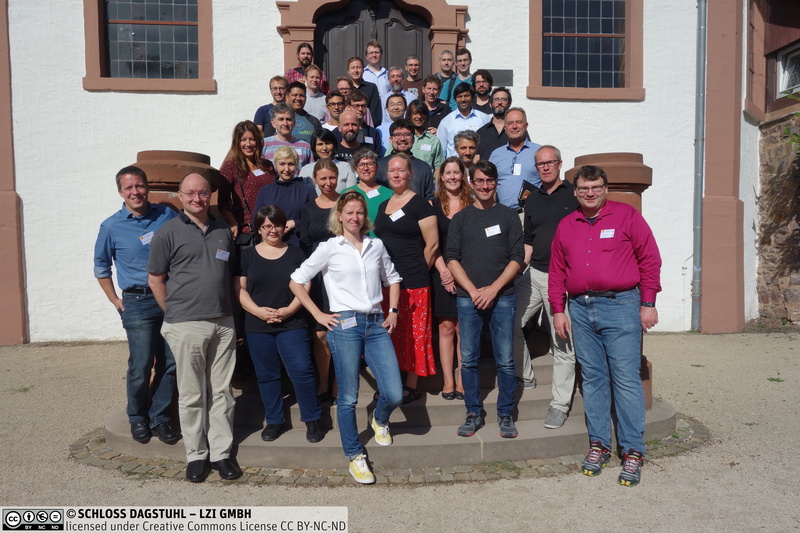 In terms of research challenges, much of what was discussed reflects the same kinds of ideas that were discussed at the recent Dagstuhl Knowledge Graph Seminar so I’ll point you to my summary from that event. Finally, for most enterprises, their knowledge graph(s) were considered a unique asset to the company. This led to an interesting discussion about how to share “common knowledge” and the need to be able to merge such knowledge with local knowledge. This leads to my next theme from the conference. Fittingly enough, Markus Krötzsch and team won the best in-use paper with a convincing demonstration of how well semantic technologies have worked as the query environment for Wikidata. Furthermore, Denny Vrandečić (one of the founders of Wikidata) won the best blue sky paper with the idea of rendering Wikipedia articles directly from Wikidata. As an aside, the work on learning rules and the complementarity of rules to other forms of prediction was an interesting thread in the conference. Besides the above paper, see the work from Heiner Stuckenschmidt’s group on evaluating rules and embedding approaches for knowledge graph completion. The work of Fabian Suchanek’s group on the representativeness of knowledge bases is applicable as well in order to tell whether rule learning from knowledge graphs is coming from a representative source and is also interesting in its own right. Lastly, I thought the use of rules in Beretta et al.’s work to quantify the evidence of an assertion in a knowledge graph to help improve reliability was neat. The final theme is a bit harder for me to solidify and articulate but it lies at the intersection of information quality and how that information is being used. It’s not just knowing the provenance of information but it’s knowing how information propagates and was intended to be used. Both the upstream and downstream need to be considered. As a consumer of information I want to know the reliability of the information I’m consuming. As a producer I want to know if my information is being used for what it was intended for. The later problem was demonstrated by the keynote from Jennifer Golbeck on privacy. She touched on a wide variety of work but in particular it’s clear that people don’t know but are concerned with what is happening to their data. There was also quite a bit of discussion going on about the decentralized web and Tim Berners-Lee’s Solid project throughout the conference. The workshop on decentralization was well attended. Something to keep your eye on. The keynote by Natasha Noy also touched more broadly on the necessity of quality information this time with respect to scientific data. All this is to say that this is an absolutely critical topic and one where the standard “more research is needed” is very true. I’m happy to see this community thinking about it. ISWC 2018 definitely added to that body of knowledge but more importantly I think did a fantastic job of reinforcing and exciting the community. You should read Helena Deus’s trip report as well. Food + Knowledge Graphs – Yummy! Pretty excited about the WebIsALOD in general and as a database of provenance. Cool to see provenance being used to improve SPARQL query performance. Really enjoyed the Crowd Truth tutorial. A case study in open data. We spent time trying to apply their measures to my data. All of the Journal of Web Semantics available as preprints. Also it was JWS’s 15th year. Did I mention California has really nice weather and is beautiful? Datalog implemented in Bash – so cool! Aidan Hogan and co – crushing it. Thanks to twitter or I would have forgotten a lot of stuff. I’ll see you in New Zealand. Last week, I was at Dagstuhl for a seminar on knowledge graphs specifically focused on new directions for knowledge representation. Knowledge Graphs have exploded in practice since the release of Google’s Knowledge Graph in 2012. Examples include knowledge graphs at AirBnb, Zalando, and Thomson Reuters. Beyond commercial knowledge graphs, there are many successful academic/public knowledge graphs including WikiData, Yago, and Nell. The research in this area is found across fields of computer science ranging from the semantic web community to natural language processing and machine learning and databases. This is reflected in the recent CFP for the new Automated Knowledge Base Construction Conference. This particular seminar primarily brought together folks who had a “home” community in the semantic web but were deeply engaged with another community. For example, Prof. Maria-Esther Vidal who is well versed in the database literature. This was nice in that there was already quite a lot of common ground but people who could effectively communicate or at least point to what’s happening in other areas. This was different than many of the other Dagstuhl seminars I’ve been to (this was my 6th), which were much more about bringing together different areas. I think both styles are useful but it felt like we could go faster as the language barrier was lower. We are increasingly seeing knowledge graphs that cover an entire category of entities. For example, Amazon’s product graph aims to be a knowledge graph of all products in the world, one can think of Google and Apple maps as databases of every location in the world, a database of every company that has ever had a web page, or a database of everyone in India. Two things stand out. One, is that these are large sets of instance data. I would contend their focus is not deeply modeling the domain in some expressive logic ala Cyc. Second, a majority of these databases are built by private companies. I think it’s an interesting question as to whether things like Wikidata can equal these private knowledge graphs in a public way. Once you start thinking at this scale, a number of interesting questions arise: how you keep these massive graphs up to date; can you integrate these graphs, how do you manage access control and policies (“controlled access”); what can you do with this; can we extend these sorts of graphs to the physical system (e.g. in IoT); what about a knowledge graph of happenings (ie. events). Fundamentally, I think this “everything notion” is a useful framing device for research challenges. A big discussion point during the seminar was the integration of symbolic and sub-symbolic representations. I think that’s obvious given the success of deep learning and importantly in the representation space – embeddings. I liked how Michael Witbrock framed symbols as a strong prior on something being the case. Indeed, using background knowledge has been shown to improve learning performance on several tasks (e.g. Baier et al. 2018, Marino et al. 2017). But this topic in general got us thinking about the usefulness of knowledge graphs as an exchange mechanism for machines. There’s is a bit of semantic web dogma that expressing things in a variant of logic helps for machine to machine communication. This is true to some degree but you can imagine that machines might like to consume a massive matrix of numbers instead of human readable symbols with logical operators. Given that, then, what’s the role of knowledge graphs? One can hypothesize that it is for the exchange of large scale information between humanity and machines and vis versa. Currently, when people communicate large amounts of data they turn towards structure (i.e. libraries, websites with strong information architectures, databases). Why not use the same approach to communicate with machines then. Thus, knowledge graphs can be thought of as a useful medium of exchange between what machines are generating and what humanity would like to consume. On a somewhat less grand note, we discussed the role of integrating different forms of representation in one knowledge graph. For example, keeping images represented as images and audio represented as audio alongside facts within the same knowledge graph. Additionally, we discussed different mechanisms for attaching semantics to the symbols in knowledge graphs (e.g. latent embeddings of symbols). I tried to capture some of that thinking in a brief overview talk. In general, as we think of knowledge graphs as a communication medium we should think how to both tweak and expand the existing languages of expression we use for them and the semantics of those languages. Juan Sequeda’s thinking emerging from his practical experience on the need for knowledge / data engineers to build knowledge graphs and the lack of tooling for them. In some sense, this was a call to revisit the work of ontology engineering but now in the light of this larger scale and extensive adoption. The facts established by the work of Wouter Beek and co on empirical semantics that in large scale knowledge graphs actually how people express information differs from the intended underlying semantics. The notions of how biases and perspectives are reflected in knowledge graphs and the steps taken to begin to address these. A good example is the work of wikidata community to present the biases and gaps in its knowledge base. The success of schema.org and managing the overlapping needs of communities. This stood out because of the launch of Google Dataset search service based on schema.org metadata. There is critical need for more data about the interface between the knowledge graph and its maintainers and users. As I mentioned, there was lots more that was discussed and I hope the eventual report will capture this. Overall, it was fantastic to spend a week with the people below – both fun and thought provoking. Definitions! – Obviously we need a lattice. Or we just embrace the notion that its an inclusive concept…. this is something I like. A couple of weeks ago I was at Provenance Week 2018 – a biennial conference that brings together various communities working on data provenance. Personally, it’s a fantastic event as it’s an opportunity to see the range of work going on from provenance in astronomy data to the newest work on database theory for provenance. Bringing together these various strands is important as there is work from across computer science that touches on data provenance. The folks at Kings College London, led by Vasa Curcin, did a fantastic job of organizing the event including great social outings on-top of their department building and with a boat ride along the thames. They also catered to the world cup fans as well. Thanks Vasa! The two years since the last provenance week have seen a number of improved systems for capturing provenance. In the systems setting, DARPAs Transparent Computing program has given a boost to scaling out provenance capture systems. These systems use deep operating system instrumentation to capture logs over the past several years these have become more efficient and scalable e.g. Camflow, SPADE. This connects with the work we’ve been doing on improving capture using whole system record-and-replay. You can now run these systems almost full-time although they capture significant amounts of data (3 days = ~110 GB). Indeed, the folks at Galois presented an impressive looking graph database specifically focused on working with provenance and time series data streaming from these systems. Beyond the security use case, sciunit.run was a a neat tool using execution traces to produce reproducible computational experiments. There were also a number of systems for improving the generation of instrumentation to capture provenance. UML2PROV automatically generates provenance instrumentation from UML diagrams and source code using the provenance templates approach. (Also used to capture provenance in an IoT setting.) Curator implements provenance capture for micro-services using existing logging libraries. Similarly, UNICORE now implements provenance for its HPC environment. I still believe structured logging is one of the under rated ways of integrating provenance capture into systems. Lastly, there was some initial work on extracting provenance of health studies directly from published literature which I thought was a interesting way of recovering provenance. Using provenance to determine what to recompute seems to have a number of interesting applications in different domains. Paolo Missier showed for example how it can be used to determine when to recompute in next generation sequencing pipelines. I particular liked their notion of a re-computation front – what set of past executions do you need to re-execute in order to address the change in data. Wrattler was a neat extension of the computational notebook idea that showed how provenance can be used to automatically propagate changes through notebook executions and support suggestions. Marta Mattoso‘s team discussed the application of provenance to track the adjustments when performing steering of executions in complex HPC applications. The work of Melanie Herschel‘s team on provenance for data integration points to the benefits of potentially applying recomputation using provenance to make the iterative nature of data integration speedier as she enumerated in her presentation at the recomputation worskhop. You can see all the abstracts from the workshop here. I understand from Paolo that they will produce a report from the discussions there. Overall, I left provenance week encouraged by the state of the community, the number of interesting application areas, and the plethora of research questions to work on. Very nice introduction to Provenance in Databases + Semirings from Pierre Senellart. W3C Prov popped up in a ton of talks and it clearly serves as an excellent reference point in the community and even enables some inoperability. Good to see the relaunch of openprovenance.org – lots of good tools for working with W3C PROV. The early part of last week I attended the Web Science 2018 conference. It was hosted here in Amsterdam which was nice for me. It was nice to be at a conference where I could go home in the evening. Web Science is an interesting research area in that it treats the Web itself as an object of study. It’s a highly interdisciplinary area that combines primarily social science with computer science. I always envision it as a loop with studies of what’s actually going on the Web leading to new interventions on the Web which we then need to study. The conference also hosted Tim Berners-Lee ACM Turing lecture, which is an obviously big deal. This was opened up to the public. There were ~900 people there. It was an excellent talk giving a history of the web and thoughts about its current status. Video will be available soon. Interesting work on how people evaluate the credibility of online news in search engine result pages. Nice reproducibility pack from Laura Hollink & co at CWI on gender differences on wikipedia. My favorite talk by far “Not Every Remix is an Innovation” – looking at tracking remixing in an online 3D printing sharing community. Amazing insights into process. Future of Semantics on the Web – nice overview and some good next steps but I wanted something bolder. Why web archives are so important for research. Super-turkers – can you make a living crowd sourcing? It’s also worth pointing out that this is just the research track. There were 27 workshops, 21 tutorials, 30 demos (Paul was co-chair), 62 posters, four collocated conferences/events, 4 challenges, a developer track and programming track, a project track, an industry track, and… We are probably missing something as well. Suffice to say, even with the best work of the organizers it was hard to figure out what to see. Organizing an event with 2200+ attendees is a thing is a massive task – over 80 chairs were involved not to mention the PC and the local heavy lifting. Congrats to Fabien, Pierre-Antoine, Lionel and the whole committee for pulling it off. It’s also great to see as well that the proceedings are open access and available on the web. The Web community is really owning it’s responsibility to help mitigate the destructive uses to which the Web is put. From the “Recoding Black Mirror” workshop, which we were sad to miss, through the opening keynote and the tracks on Security and Privacy and Fact Checking, this was a major topic throughout the conference. Democracy in some contexts can be like antibiotics: too much gives growth to antibiotic resistant bacteria. His takeaway is that we need a bit of paternalism in this context now. His talk was pretty compelling, you can check out the full video here. Additionally, Corey was able to attend the panel discussion that opened the “Journalism, Misinformation, and Fact-Checking” track, which included representation from the Credibility Coalition, the International Fact Checking Network, MIT, and WikiMedia. There was a discussion of how to set up economies of trust in the age of attention economies, and while some panelists agreed with Floridi’s call for some paternalism, there was also a warning that some techniques we might deploy to mitigate these risks could lead to “accidental authoritarianism.” The Credibility Coalition also provided an interesting review of how to define credibility indicators for news looking at over 16 indicators of credibility. We were able to see parts of the “Web and Society track”, which included a number of papers related to social justice oriented themes. This included an excellent paper that showed how recommender systems in social networks often exacerbate and amplify gender and racial disparity in social network connections and engagement. Additionally, many papers addressed the relationship between the mainstream media and the web. (e.g. political polarization and social media, media and public attention using the web). presented at @TheWebConf today! spoiler alert: your secrets are not safe, so do not "browse like no one's watching". More generally, it seems the question is how do we achieve quality assessment at scale? Knowledge graphs and heterogenous networks (there was a workshop on that) were a big part of the conference. Indeed the test of time paper award went to the original Yago paper. There were a number of talks about improving knowledge graphs for example for improving on question answering tasks, determining attributes that are needed to complete a KG or improving relation extraction. While tables have always been an input to knowledge graph construction (e.g. wikpedia infoboxes), an interesting turn was towards treating tabular data as a focus area. There was a workshop on data search with a number of papers on the theme. In that workshop, Maarten de Rijke gave a keynote on the work his team has been doing in the context of data search project with Elsevier. In the main track, there was an excellent talk on Ad-Hoc Table Retrieval using Semantic Similarity. They looked at finding semantically central columns to provide a rank list of columns. More broadly they are looking at spreadsheet compilation as the task (see smarttables.cc and the dataset for that task.) Furthermore, the paper Towards Annotating Relational Data on the Web with Language Models looked at enriching tables through linking into a knowledge graph. But what was interesting was her labs use of an observatory of 200 participants who allowed their Windows home computers to be instrumented. This kind of instrumentation gives deep insight into how users actually use their browsers and security settings. In the paper by Wei Sui and co-authors on Computational Creative Advertisements presented at the HumL workshop – they use in-home facial and video tracking to measure emotional response to ads by volunteers. The final example was the use of FMRI scans to track brain activity of participants during web search tasks. All these examples provide amazing insights into how people use these technologies but as these sorts of methods are more broadly adopted, we need to make sure to adopt the kinds of safe-guards adopted by these researchers – e.g. consent, IRBs, anonymization. Researchers at the University of Bologna who are working with Elsevier, building an XML processing pipeline to convert a small set of Chemical Engineering articles to RDF, and capture citation motivations using the CITO Ontology. A talk on using Springer Natures SciGraph to extract author affiliations for major web conferences, and do a longitudinal study of geographical trends. They found that, for ISWC, ESWC, and TPDL, 20% of countries produce 80% of publications, and there is very little turnover. Among Corey’s favorites was a presentation on a Web Application for creating and sharing visual bibliographies. VisualBib is a compelling use case for visualization of citations and cited works over time. Also, at SAVE-SD was Lab’s own work on extracting discourse segment types in scientific text. In the demo track, the etymo.io search engine was presented to summarize and visualization of scientific papers. Kuansan Wang at the BigNet workshop talked about Microsoft Academic Search and the difficulties and opportunities in processing so much scientific data. In the panel, Structured Data on the Web 7.0, Google’s Evgeniy Gabrilovich – creator of the Knowledge Vote – noted the challenges of getting highly correct data for Google’s Medical Knowledge graph and that doing this automatically is still difficult. Finally, using DOIs for studying persistent identifier use over time on the Web. Prior trip reports of Paul’s from WWW 2015 and 2010. A cool tutorial on representation learning for networks from Stanford. – Another thing we wanted to sit in but couldn’t. Abstract state machines and linked-data-fu used for work task analysis in VR. A knowledge graph of quantities. A unified view of complexity. The job fair is a good idea – but seems to be more people with badges “I’m hiring” than “I’m looking”. Paul recommends Amelie as a co-chair. Last week, I had the pleasure to be able to attend a bilateral meeting between the Royal Society and the KNAW. The aim was to strengthen the relation between the UK and Dutch scientific communities. The meeting focused on three scientific areas: quantum physics & technology; nanochemistry; and responsible data science. I was there for the latter. The event was held at Chicheley Hall which is a classic baroque English country house (think Pride & Prejudice). It’s a marvelous venue – very much similar in concept to Dagstuhl (but with an English vibe) where you are really wholly immersed in academic conversation. One of the fun things about the event was getting a glimpse of what other colleagues from other technical disciplines are doing. It was cool to see Prof. Bert Weckhuysen enthusiasm for using imaging technologies to understand catalysts at the nanoscale. Likewise, seeing both the progress and the investment (!) in quantum computing from Prof. Ian Walmsley was informative. I also got an insider intro to the challenges of engineering a quantum computer from Dr. Ruth Oulton. For more context, I suggest starting with two sources: 1) The Dutch consortium on responsible data science 2) the paper 10 Simple Rules for Responsible Big Data Research. I took away two themes both from the track as well as my various chats with people during coffee breaks, dinner and the bar. He talked compellingly about the trade-offs between consent and privacy and how the project tries to manage these issues. In particular, I thought how they handle data sharing with other researchers was interesting. It reminded me very much of how the Dutch Central Bureau of Statistics manages microdata on populations. Julian Huppert, former MP, discussed the independent review board setup up by DeepMind Health to enable transparency about their practices. He is part of that board. Interestingly, Richard Horton, Editor of the Lancet is also part of that board Furthermore, Prof. Bart Jacobs discussed the polymorphic encryption based privacy system he’s developing for a collaboration between Google’s Verily and Radboud University around Parkinson’s disease. This is an example that even the majors are engaged around these notions of responsibility. To emphasize this engagement notion even more, during the meeting a new report on the Malicious Uses of AI came out from a number or well-known organizations. One thing that I kept thinking is that we need more assets or concrete artifacts that data scientists can apply in practice. For example, I like the direction outlined in this article from Dr. Virginia Dignum about defining concrete principles using a design for values based approach. See TU Delft’s Design for Values Institute for more on this kind of approach. As data scientists, we tend to want to use an experimental / data driven approach even to these notions surrounding responsibility. While I think it’s important for computer scientists to look at different methods, it’s also important for other disciplines to gain insight into the actual process of data science itself as Dr. Linnet Taylor grappled within in her talk about observing a data governance project. Overall, I enjoyed both the setting and the content of the meeting. If we can continue to have these sorts of conversations, I think the data science field will be much better placed to deal with the ethical and other implications of our technology. Somebody remind me to bring a jacket next time I go to an English Country house! I always love it when egg codes get brought up when talking about provenance. Lots of discussion of large internet majors and monopolies. There’s lots of academic work on this but I really like Ben Thompson’s notion of aggregator’s as the way to think about them.